It's faster, better looking and more accessible. V12 introduces a completely new browser interface that meets most users' entire needs. 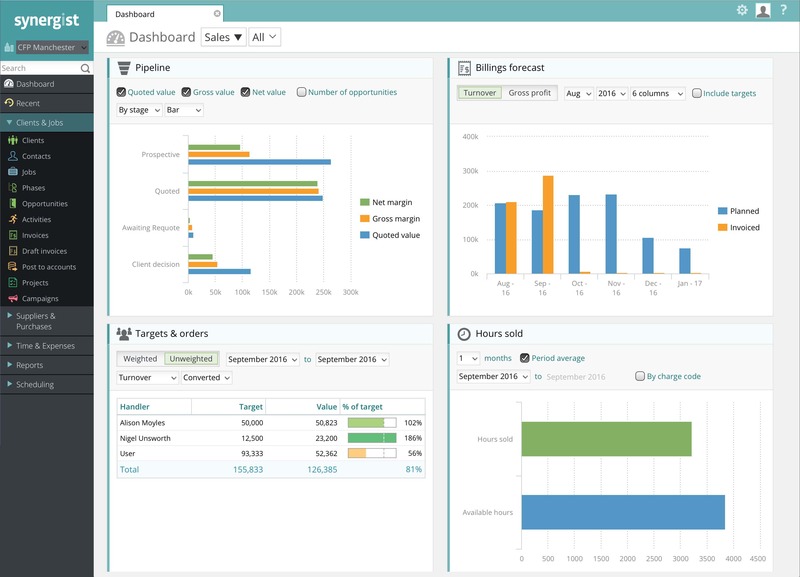 New features include dashboards for monitoring your business health at a glance. And drag and drop timing plans with dependencies make the update of jobs simple and visual. Synergist v12 filters your business data down to the information you need and makes it accessible, wherever you happen to be. Delivering the power of Synergist via a convenient, fast and accessible browser interface. With no software or plugins to install, you just get instant access to your complete business management system. With Synergist v12 you are informed and productive wherever you are. This enables you to give your most valued resources the support and flexibility they need to deliver to their full potential. 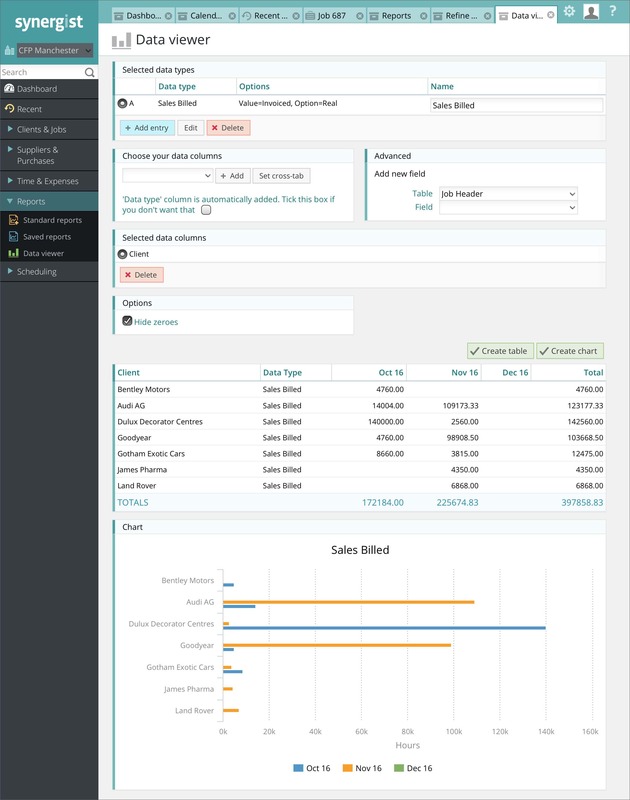 In just a few seconds the Synergist dashboard gives you an overview of the health of your business. Delivering instant reassurance and peace of mind, or drawing your attention to a developing issue whilst there’s time to correct it. With the facility to set targets you can define your business aims and ensure the entire team has the visibility they require of any shortfalls in performance. 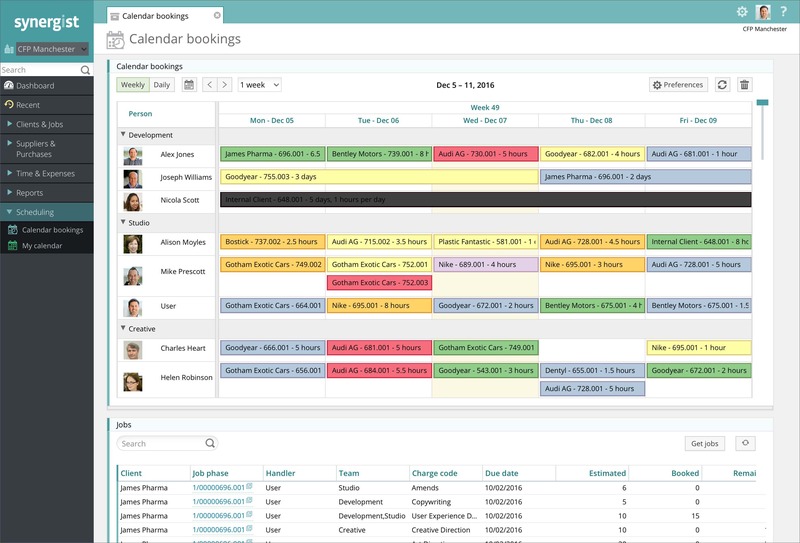 Whatever the size of your team and wherever they’re based, v12 gives you a single platform for visualising and planning all upcoming work. 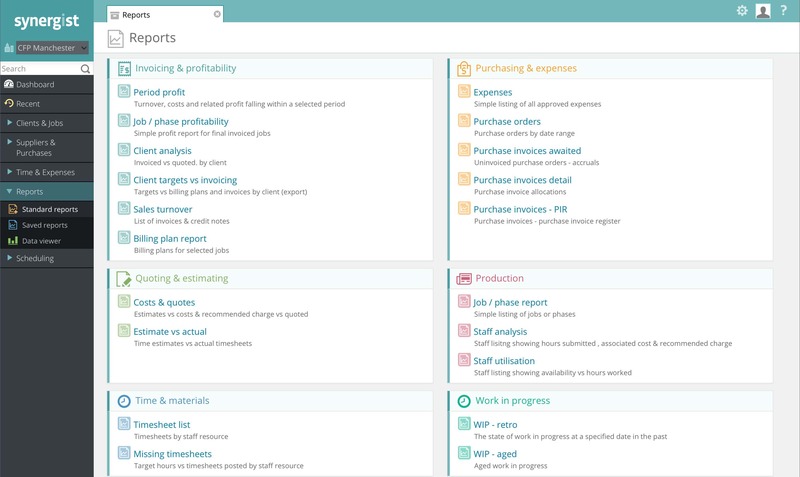 A simple drag and drop browser interface to solve the complex challenge of delivering projects on time, whilst hitting the utilisation targets you’ve set. Timing plans are of limited value if they don’t reflect the current project status. With v12 we’ve therefore focused on making the update of them quick and easy. With a beautiful interface and intelligent dependencies, updating one phase/stage can update all following stages/phases as well as associated billing plans. The addition of visual % completion tools also allow progress updates to be made via the same interface. The entire collection of standard Synergist reports have been given an extensive visual makeover in v12. This ensures you receive information in a familiar layout whilst improving readability and therefore making them quicker to interpret. The report selection and filtering tools have been redesigned as part of the process of migrating them to the browser interface. This gives a clearer more powerful set of options for selecting the information you require. As a result of its popularity we’ve received many requests for additional fields and features to be added to the data viewer. These have appeared in previous releases, but with v12 we have completely rewritten the data selection interface to dramatically improve its power and usability. You can now select any field from the database for use when specifying how to cut selected data. You can also include multiple data types on the same report, with different date selections per data type. Instant charting is also included and as all this is available in a browser, reporting can be done from anywhere. The Synergist API continues to expand and in both endpoints and functionality. This is in response to user requests as well as our own needs in delivering enhanced mobile app functionality etc. To make the Synergist API information more accessible we have transferred it to an API documentation platform.